Strangely, brake upgrades are often overlooked when it comes to 4WD’s. They’re simple, cost-effective and work extremely well to improve performance and safety, but regardless they’re often shuffled down to the bottom of the modification list of many budding 4WD enthusiasts. At DBA we take great pride in not only manufacturing quality products, but also showing how and why they work. 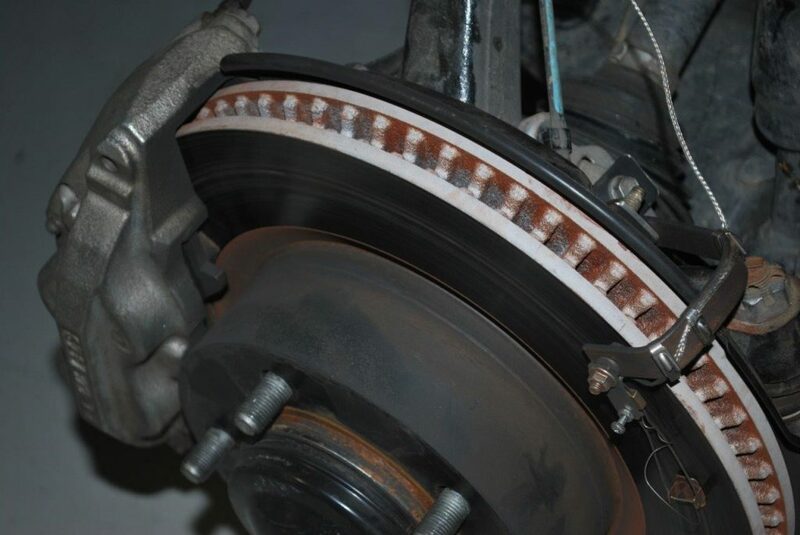 Which is why we decided to put one of our most straightforward brake disc upgrades to the test, on the much beloved 200 Series Toyota Landcruiser. Nothing overtly complicated, just a standardized emergency braking test from 100km/h to standstill, with both an OEM brake setup, and then DBA’s disc upgrade – without changing the physical size (diameter) of the discs themselves, or the calipers. 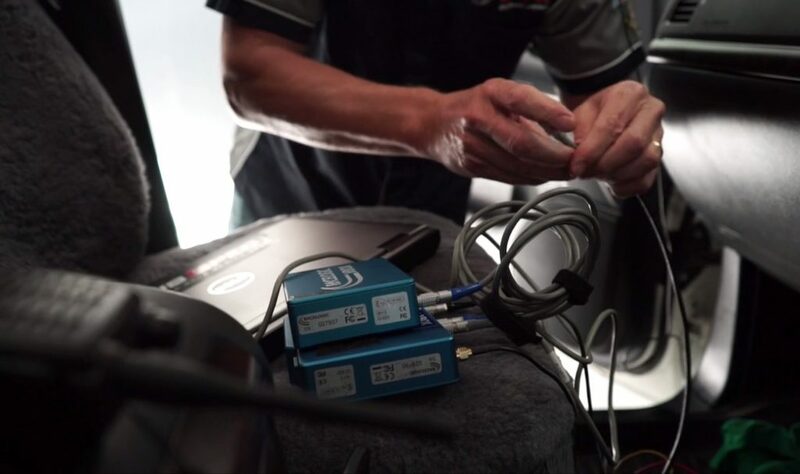 For the sake of not only parity, but also accuracy, the tests were carried out to the standard of the German AMS test, where 10 full ABS brake stops are conducted from 100km/h to 0km/h in quick succession, to measure the effectiveness of temperature over stopping power. A V-Box data collection system was fitted, with thermocouples attached at the rotors for collection of disc temperature. The V-Box was chosen as the data it produces is all-encompassing, logging everything from stopping distances in metres to stopping time, brake application, vehicle speed and much more where the metal meets the meat. Not wanting to miss any details, the 200-Series Landcruiser was first taken across the weighbridge to uncover the specific amount of unladen weight we were dealing with – approximately 3 tonnes, as it so turned out. Then came the first test with the standard OEM brake discs and pads. The Landcruiser was subjected to 10 brake stops from 100km/h to standstill, in quick succession. Not surprisingly, the big Toyota suffered some serious brake fade, progressively growing the distance to stop and utterly cooking the brakes in the process. Braking performance was quite severely compromised. 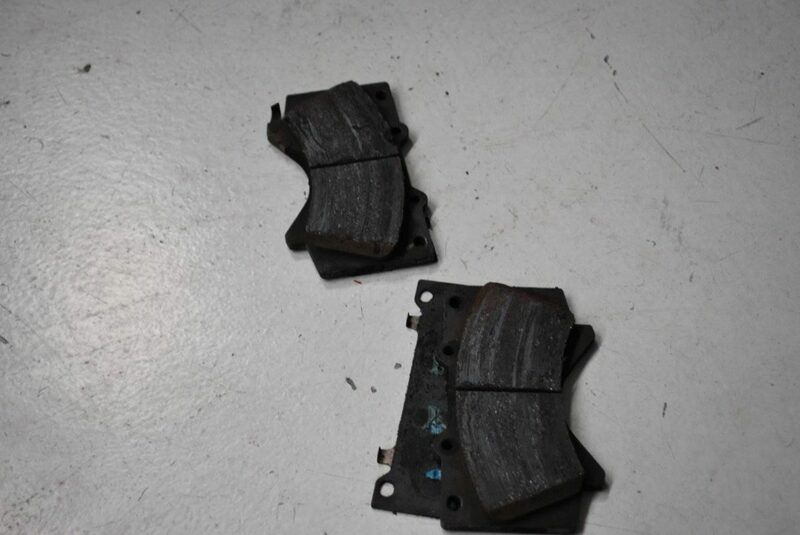 By the time the Landcruiser arrived back at the workshop to have the upgrade fitted, the OEM brakes had revealed that they were a white-hot mess, while the brake pad material had decayed significantly into a crumbling pile of fried charcoal. They were no longer serviceable by any means. The DBA upgrade was then fitted to the Landcruiser, consisting of 4×4 Survival Series T3 4000 slotted discs, DS Performance brake pads and Ferodo Performance DOT5.1 brake fluid. 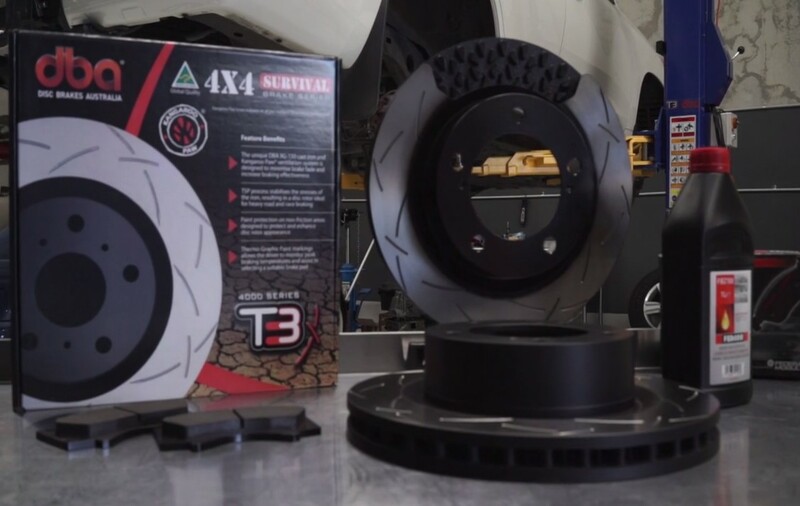 The DBA 4000 T3 slotted DBA discs are made for tackling more advanced braking situations particularly when hauling around heavy weight and 4WDing, and they feature DBA’s patented Kangaroo Paw vane ventilation system, which alone outperforms straight vane rotors by up to 20% via increased heat dissipation. Once again the 200 Series ‘Cruiser completed 10 brake stops from 100km/h to standstill, in quick succession. It became immediately evident that not only was the Landcruiser pulling up consistently better, but it was performing increasingly well the hotter the brakes got. No brake fade was evident by the 10th and final stop. 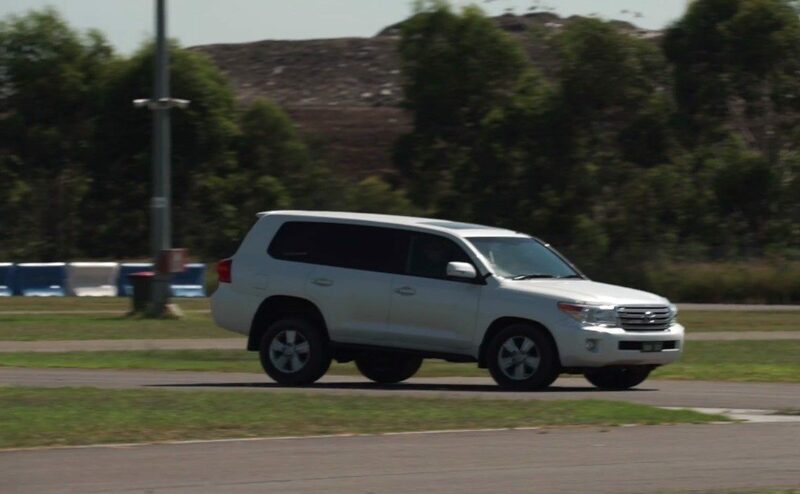 After the test, the team went straight for the V-Box data to solidify the seat-of-pants improvement and discovered that the DBA upgrade was able to consistently decelerate the Landcruiser at an additional 1.52 metres per second, for a total 100km/h to standstill time of 4.3 seconds on average. The DBA upgrade also shortened the stopping distance by 6.5 metres on average, and at the time that the DBA setup was at standstill, the OEM setup was still travelling at 37km/h in the unladen Landcruiser – which is where the real difference is found. An unladen 3 tonne vehicle hitting a stationary object at 37km/h is not only a hefty hit, but add in extra weight like additional passengers, a boat trailer, caravan, camping gear or a hauled load, and it becomes evident why a brake upgrade is worth its weight in gold. It’s a safety improvement we’re proud of, and it cements why DBA upgrades are used on 4WD’s, heavy armoured fleets, road trains and military applications across the globe.